The Quoddy style bed shown here in Birdseye Maple, complimented by the Quoddy Hope Chest, with a hand rubbed oil and wax finish that lets the beauty of the wood grain show. This bed can be made in a variety of other woods as listed below.This bed can be ordered without the Quoddy style footer. A Maine Cottage style footer can be substituted if a simpler look is desired. All beds come standard with a four-piece removable platform to hold the mattress. The bed does not require a box spring. Optionally hardwood slats can be ordered as an alternative for the platform to support the mattress. 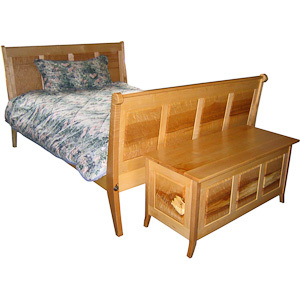 Optionally the Quoddy Bed can be ordered without the footer or with a Maine Cottage style footer. The Hope Chest was selected as one of several pieces in the Maine Wood 2008 contest by the Messler Gallery at the Center for Furniture Craftsmanship in Rockport, Maine.